Lets play the audio files on your computer! 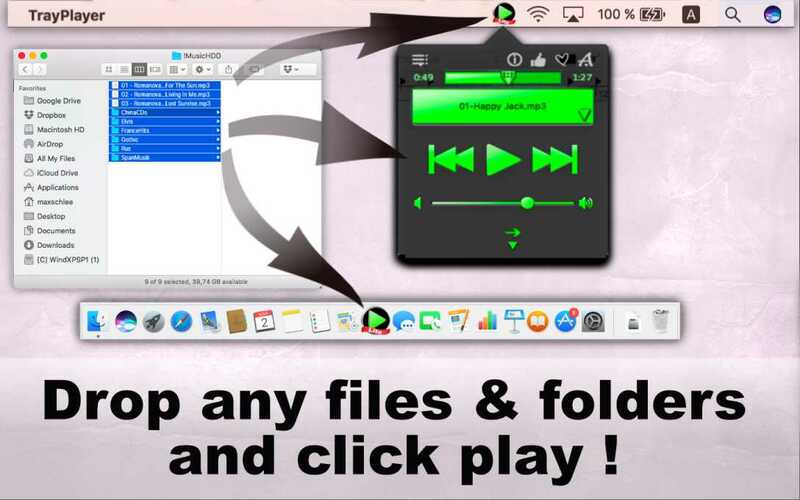 Tray Player Lite is a free app that allows you to play audio files on your computer. This tiny player quickly sorts through the files that you Drag & Drop into the app, and plays only the files that contain audio. In addition to MP3 files, Tray Player Lite supports the following formats: MP3, M4A, WAV, AIFF, CAF, MP4, MP2, MP1, AAC, AU, M4R, TS, MOV, QT, MPG, 3G2, VOB. The controls on this player resemble those of a hand-held MP3 player: Play, Pause, Rewind, Fast-forward. 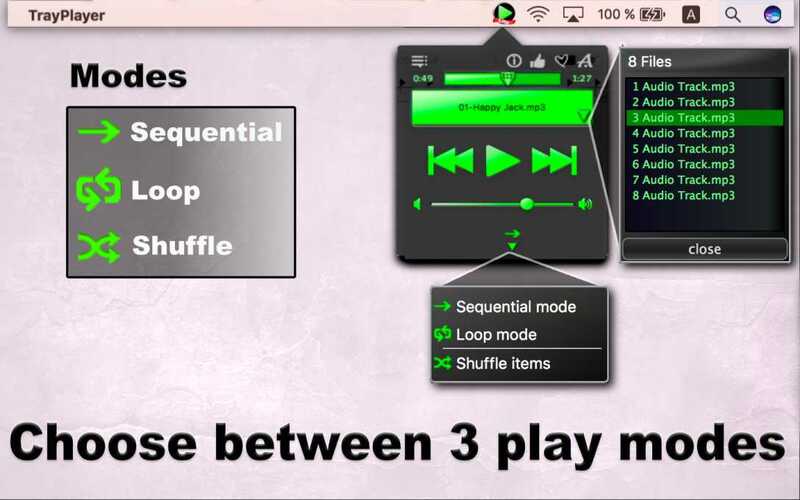 Select from 3 play modes: in order (Sequential), Loop, or Shuffle. The player displays the name of the track currently playing, and you can skip to the exact spot in this track. You can also see the list of your tracks and add new files to that list any time you want, up to 10 tracks total. For an unlimited number of tracks, upgrade to the full version of this app, Tray Player. Drag & Drop your audio files into one of the 3 locations: the app window, the app icon in the status menu, or the one in the dock, choose a play mode and hit Play! Download it today! For more information, see our Introduction screen shots. Hello and welcome to tray player. Tray Player is an app that allows you to play audio files on your computer. It doesn’t take up room on your screen since it shows up in the status menu as well as in the dock. Right here you can feed it any files and folders. Just drag and drop your audio files into one of the three locations: the app window, the app icon in the status menu or pull into the dock. Let’s drag a drop a folder into the status menu icon. The player quickly sorts the files and folders that you dragged and dropped into the app and placed only the files that contain the audio. See it added 10 tracks to the place. So we can now try to put a few music files into the dock icon. If we add those files I’m going to have 13 tracks and if the new files we will erase the files that we added first time and will have only three music files in the player. Let’s set the files see! The tray players controls looks like handheld mp3 player: play, pause, next, previous. You can adjust the volume right here. Then you can select to play your tracks: in order with sequentially, on the loop or shuffle them. If you want to pause the music you can either click on the pause button in the app window, or you can also hold down the control key on the keyboard and click on the icon in the status menu. 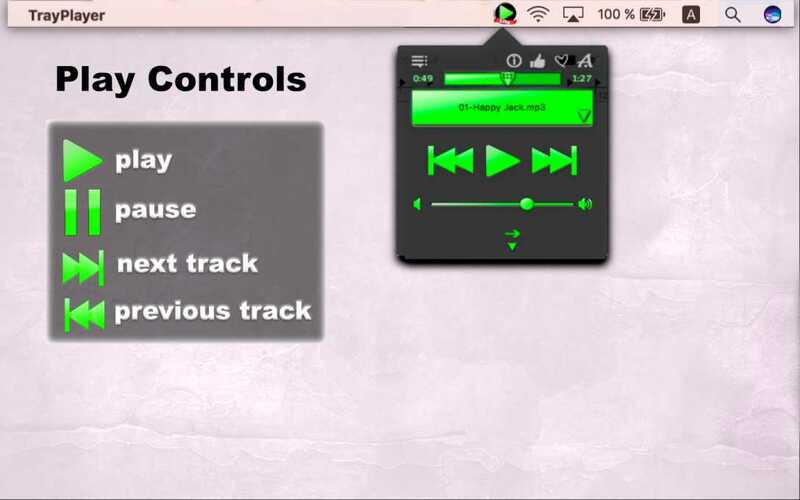 Hold down the control button, see the player displays the name of the track currently played. You can also see the list of your tracks and add new tracks to them at any time. See how easy it is download try player now!